The sidewalks are being redone down the road a bit from my apartment. Old stones are removed, new sectional curbs are put in place, a base of sand is put down, and then the pavers are set into place with wooden and rubber mallets. Half-pavers are pre-cut. If more precise fitting is necessary, some specialists with a power saw will come through toward the end of the job and take care of the task. After the pavers are all in place, sand is spread over them to fill the seams, with the remaining sand then swept-off. The work happens all through the day and into the night. To keep the wheelbarrows and other equipment safe when the crew does call it quits for the evening, the equipment is linked together by a metal cable, and a guard sleeps on a nearby cot. You can see the unfinished sidewalk in the right foreground of this shot. In the background, there is some sand that was spread on a more complete section. 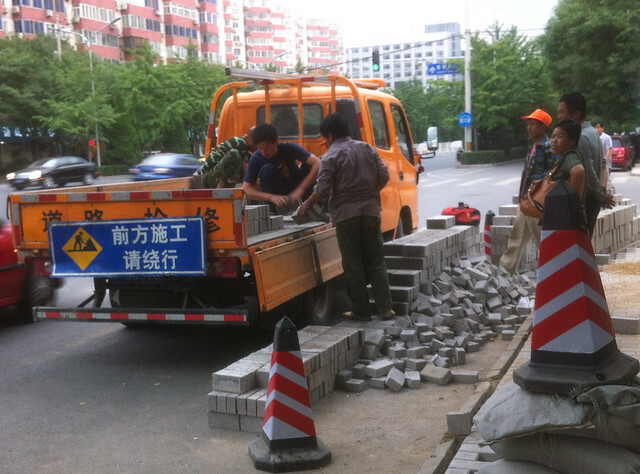 I think that the gentlemen were loading excess pavers onto the truck. Most sidewalks I’ve seen in the US poured concrete. If pavers are used for some work, they are usually delivered on pallets, which are loaded and unloaded by forklifts. In the US, we have the legend of John Henry, who was pitted against machine in a steel-driving contest. He won the contest but died soon after from exhaustion. The machine then went-on to replace men and make lives “easier”. In China, there are — quite literally — still people driving steel by hand. Which isn’t to say that there isn’t a lot of high-tech stuff happening here. But, I think there is more of a balanced approach. Perhaps, yes, because labor is so cheap, but also because folks might think that doing work, even manual work, is better than sitting around and watching television. Okay, it is late, I’m tired, and the wife got home a wee bit ago. Perhaps more later. In the meantime, comments would be appreciated. My comment is that you should keep up this interesting commentary in addition to the wonderful photos you post. It’s great getting your “American in China” view of everyday life in Beijing. Thanks for taking the time!